I suppose this is the obligatory “I’m exhausted” mommy blog post. Well I am. Punkie has a virus, we believe, from day care . . . again. This one gives him a high fever and some nasal congestion. The fever keeps coming back and I’ve been waking up at night to give Punkie some medication to keep the temp down. And now I’m exhausted. I’m basically a lawyerly zombie today. One does not simply walk into Mordor . . . 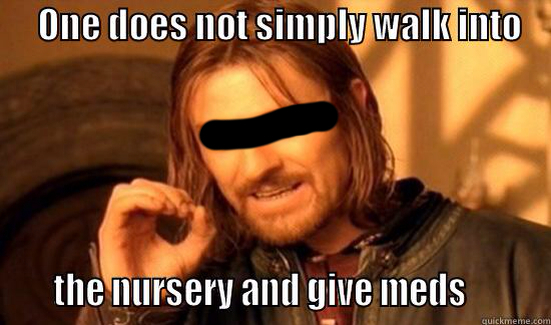 I mean, the nursery, and give medication. You need to cajole and beg the baby to go back to sleep afterward. This is the crux of the issue here. Last night, he took his medication and then decided he didn’t want to be alone in his crib. Every time I laid him down, he kicked and yelled and cried. If I picked him up, he was asleep in one minute . . . until I laid him down, in which case he was immediately awake again. Eventually, I brought him to bed with us and he fell asleep, but not until we had lost two hours of sleep. Can I remind you that I’m 40 and losing two hours of sleep slays me? Or, maybe it “undeads” me, and I’ve been undead since Friday. When I was in my 20’s, I could stay up all night and still function. Now, in my 40’s, all I can say is BRAINS. This entry was tagged baby fever, lawyer mommy, mommy blog, sick baby. Bookmark the permalink.